Swarthmore generally does a good job picking each class of student it accepts. It focuses on diversity of people and perspectives, and while it could do better in enrolling low-income and minority students, its choices are trending in the right direction. Despite this progress, though, Swarthmore has one major blind spot. In recent memory, the college has failed to enroll a single American military veteran who has claimed Veterans Affairs benefits, according to the registrar’s office. In fact, the school has a similarly rough record when it comes to accepting the children of members of the US military. 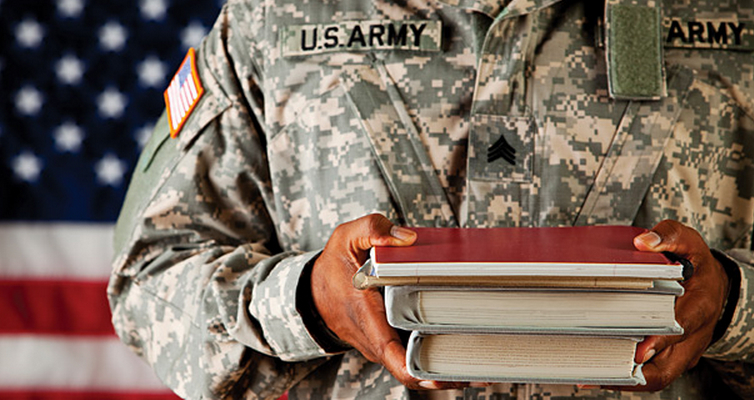 Only four enrolled students are collecting VA benefits from their family members through the Post 9/11 GI Bill. Around 0.4 percent of Americans are currently serving in the military. If we were to extrapolate that demographic to Swarthmore’s student body we would expect 6 students to be military members. Of course, this isn’t necessarily an accurate picture of the number of veterans that actually end up attending college. Using another count, Swarthmore’s track record doesn’t improve. Around 4% of all undergraduate students in the United States receive some sort of student aid from the VA, either as a family member or as a veteran. By this count, 63 students at Swarthmore should be receiving aid from the GI Bill. Of course, there are some mitigating factors. American veterans generally enter college in their early twenties, which isn’t normal for Swarthmore, and some even have started families by the time they enter school. But this hasn’t stopped many of Swarthmore’s peer institutions from accepting American Veterans. As of 2015, Wesleyan enrolled 22 American Veterans, Williams 1, Wellesley 1, Mount Holyoke 4, and Amherst 8. Veterans clearly want to attend the top liberal arts schools in the country; they’re just not coming to Swarthmore. It’s also not as though Swarthmore doesn’t have its fair share of older students. In fact, there are numerous student veterans from around the world who fulfilled their country’s mandatory service requirement before coming to Swarthmore. The existence of a demographic gap between the general population and Swarthmore’s student body, in and of itself, doesn’t necessarily mean that we must fight for higher representation from American Veterans. But there are still two strong reasons we need more American veterans at Swarthmore. First, American veterans have so much to teach Swatties about the world. In many cases, they’ve traveled the globe and have a depth of life experiences that come with it. Of course, the realities of war also mean that they also know far more about the pain and violence in the world than most of us ever will. We can’t forget that veterans coming home from the Vietnam War, and going to college on the GI Bill, helped fundamentally change the culture of campuses. Student veterans were often vocal leaders on both sides of the war protests that broke out across campuses throughout the late 1960s and early 1970s. American veterans of conflicts in the Middle East have an important voice that should be represented on campus. Second, and most importantly, Swarthmore simply has a duty to help American veterans regardless of whether they strengthen the campus community. These are people who have, in many instances, put their lives on the line for the security of the country. They’ve spent their blood, sweat, and tears in public service and deserve recognition for this sacrifice. I realize that many Swatties may not respect the way many of the United States’ interventions have been fought, but this is an entirely separate debate than the one I’m trying to have. Many of the men and women fighting in Iraq and Afghanistan also disagreed with their mission, yet they carried it out because it was their duty to follow the will of the president, congress, and people. Swatties can disagree with the wars of the last decade while welcoming American veterans with open arms. Recruiting veterans also falls well within one of Swarthmore’s implicit goals of pursuing social justice. Swarthmore students and administrators always seem to say they have a commitment to helping those in need, and American veterans certainly fall in this category. Even though veterans make up around 9 percent of the United States’ population, they are sadly responsible for 18 percent of its suicides. Despite massive efforts to fix the problem, veterans also have a higher unemployment rate than the rest of the population. If Swarthmore wants to live up to its reputation as a leader in social justice, it should reach out to American veterans and give them the chance to attend one of the best schools in the country. Allowing them to study at top institutions is one of the simplest ways to help them solve issues within veteran communities. A good first step is to, at the very least, increase the school’s participation in veteran recruitment programs to attract applications from people with military backgrounds. Part of the problem could be that veterans may not even know that Swarthmore is accessible to them. Articles, like this one published in The New York Times, seem to indicate that low application numbers are an issue. But beyond that, Swarthmore could start weighing veteran status more heavily in its holistic admissions process. There are any number of ways to solve this problem, and I’m sure the administration is in a much better position to brainstorm an acceptable solution than I am. While Swarthmore has made strides in its inclusiveness in recent years, reaching out to veterans is yet one more step the college needs to make to live up to its own principles. Patrick is a senior from Bethesda, Maryland and a political science major who spends so much time fretting about American politics that it's probably not all that healthy. In addition to editing for The Daily Gazette, he is a member of the Peaslee Debate Society and an occasional runner. While Patrick likes to stay busy, he regrets the fact that he has very little time for Netflix in his life because he wants to rewatch The West Wing very badly. As a student receiving Post-9/11 GI Bill benefits as part of my financial aid package, thanks for writing this and for pointing to Swarthmore’s horrendous track record when it comes to treatment and recruitment of those related to the military. The College has a questionable policy regarding how Post-9/11 GI Bill benefits factor into our student account (hint: if you’re on financial aid, they don’t!) and there have been multiple times I have been attacked based on the fact that my dad is a Navy veteran. Perhaps the thing keeping most veterans away from Swarthmore isn’t simply that the Admissions Office isn’t recruiting them, but that the culture here is so unwelcoming to anything and anyone even tangentially related to the military that they don’t want to immerse themselves in that environment for four years. I think the responsibility here falls on the students just as much as the administration in terms of creating an environment more welcoming for anyone we hope to join our community. As another student from an Air Force family, I agree with Grant. The lack of understanding and empathy for anything related to the military (especially in political science courses) was really shocking to see. It’d be nice to explore how the problem Grant mentions contributes to lack of military families at Swat. Both of my grandfathers were able to go to college and start their own business thanks to WWII and Vietnam GI Bill funding. Even if non-traditional students are interested in and qualified to come to Swat, financial aid actively discourages them from doing so. As a mere commoner who does not socialize terribly often, I’m shocked to learn that there is “lack of understanding and empathy for anything related to the military”. Thank you so much for writing this article. As the daughter of a Navy veteran, I have seen so many unfounded generalizations about military personnel– that they are all pro-war, that they aren’t smart, that they couldn’t belong at Swarthmore. My upbringing has taught me that the men and women who serve our country defy all these stereotypes. I hope that your article can start a dialogue about breaking down these stereotypes which absolutely exists in the minds of some people on our campus and unfortunately shape their idea of our country’s veterans. I’m not a hugely pro-military person, and I’d prefer that the USA not get into more wars, but I agree with and support this idea wholeheartedly. It takes a certain amount of courage, commitment, and discipline to join the military, put on the uniform, and endure harsh training, knowing that it’s very possible that you’ll be sent to die in some baking-hot desert because some idiot wants political points. I think that this courage and commitment is deserving of respect and appreciation, and that our nation does much less than it should to re-acclimatize soldiers into civilian society after their tours of duty are over. Accepting more veterans at Swat would be a small but essential start. There is a problem here with very small numbers that tends on many issues to make it difficult to make strong comparative claims about Swarthmore and its peers in terms of what they do and don’t do. Williams and Wellesley having 1 veteran each and Swarthmore having none are effectively the same thing in statistical terms, particularly since both of them have larger student bodies than Swarthmore by a considerable amount. That difference is not the outcome of a different policy or a different approach: it’s effectively random. Wesleyan is not only larger, but has graduate degrees in a number of fields and thus may have a particular appeal to older students who want to feel like they have some peers of their age within the community. Eight enrollees for Amherst, closer to our size, is a better indicator that Amherst is doing something different–very likely in this case a side effect of Amherst’s distinctively strong push to enroll first-generation and low-income students, though it may also be participation in the program that Wick Sloane mentions in his IHE essay that you link to. This essay might be a good example of where our intimacy can become insularity, when we are prone to complain about an issue or challenge as if we alone face it. We sometimes cast challenges narrowly rather than broadly, in a way that teeters on the edge of self-absorption. Meaning, inasmuch as the lack of veterans is a shortcoming, it is a general shortcoming at many highly selective liberal arts colleges and (at least according to Wick Sloane) even at larger highly selective private universities. This begs a systematic analysis rather than one that regards Swarthmore as peculiar. It also might beg for a systematic answer: the issue here may be less “no veterans” and more “very few older students”. Meaning, if small colleges typically had a population that included a considerably larger number of students in their mid-to-late 20s and even early 30s, that would very likely include a larger percentage of veterans. This point illuminates more about the nature of the problem: what would it take for Swarthmore, Williams, Amherst, Oberlin, Middlebury and so on to be appealing as a choice for a wider age range of undergraduate beginning their college education? A very significant shift in campus culture, in curricular design, and much else besides. This might be a good thing for the reasons you indicate, the virtues of which are not limited to what veterans could bring to the campus culture–more life experience, more perspective. But to put it in this way is to understand that seriously pursuing this goal might involve more than a small tweaking of admissions process. I actually agree with a lot of what you’ve said here! I’ll try to respond to a few of your points. 1. I agree that working with small numbers is a problem but unfortunately, it’s the best I have. That’s why I tried to use statistics on veteran enrollment in colleges throughout the United States, but the problem is that these statistics obviously don’t track well to Swarthmore. It’s a very messy problem to sort through and would require quite a big of digging to find a better answer. 2. Your point about age would be interesting to look into. While I don’t have statistics on the number of veterans from outside the United States I know at least four few personally. A good proxy for this is actually tracking the number of students from countries like Singapore, South Korea, and Israel since they all have mandatory service requirements. The one caveat to this is that military service in these countries usually takes less time than it does in the United States. So veterans from these countries are a year or two younger than American veterans when they enroll at Swat. 3. I actually agree that this is more of a systemic problem than one specific to Swarthmore. MIT and Princeton, for instance, only enroll one veteran each despite the fact that they are much larger than Swarthmore, are more well known to the general population, and have graduate schools. The reason I chose to write about Swarthmore specifically is because it’s generally easier to try to create some change in policy on a smaller scale. If I were to re-write this essay I still would focus on Swarthmore in particular but I would have added a few lines mentioning that we aren’t the only school with low veteran numbers. 4. Your point about the extent of the changes the school would have to make to attract veterans is a real one. I’d be interested figuring out whether things like curriculum changes are actually necessary but, from a student’s perspective, it’s very hard to tell since I don’t have access to much of the experience administrators have or the contacts with other schools that have tried to tackle this issue. The point of this essay was to start a conversation about what admitting more veterans would entail. If it truly is impossible for the school to do any better than it is right now without huge costs to other students, then I tend to think I would agree with the school’s decision. The problem is that there actually needs to be a conversation to actually determine if this is a feasible path forward or not. If you’ve heard of any internal discussions about this issue I’d actually love to hear about them. Thanks for your comment! I always enjoy reading them. 1) If you don’t have a meaningful statistic, the right approach is to exclude it or to take a step back and make a less specific claim in which it is meaningful (like maybe it is for all private institutions). “It’s messy and it’d require a lot of work” isn’t a good reason to base the core of your argument on a meaningless statistic. 2) People from countries with mandatory service requirements are really different from the US, in a way that makes it hard to make good arguments: They’re younger (maybe age is the issue — but 2yrs of service is vastly different from 6yrs of service), they’re from all spectrums of political affiliations (maybe Swat just has more liberal students), they’re from all socioeconomic groups (maybe Swarthmore weights to wealthier students). If I were to write this article I’d consider making a much broader argument — this is a problem at lots of schools — then try to identify why this is before proposing solutions. If age is the issue, the solve is v. different than if it’s something about Swarthmore’s culture that turns off people with military backgrounds. Since Swarthmore is need-aware instead of need-blind to international students, the socioeconomic part may not be true. Regardless, I think Singapore has mandatory military service (2yrs) for all males before college, so the College has no choices about Singaporean males; South Korea I think has that 2yrs right after freshman year afaik, so that doesn’t really affect admission. Conclusion: military service either does not factor in yet when admission happens, or by virtue of being compulsory makes impossible discriminating (in a neutral, original sense) the “veteran” group from the “non-vet” group. i.e. Mandatory military service should make very little difference in Swat’s college admission. Some of the countries that have mandatory service requirements that you mention allow deferments of service for students, so some of the US college matriculants from those countries may not have served yet. Others also allow for non-military civil service, so they may not be military veterans. I just came upon this article and I find it absolutely intriguing. I am the incoming commander of an element known as a Combat Stress Control detachment (we provide timely behavioral health interventions) and I have lived close to the Swarthmore community for most of my life. The residents of Swarthmore I have interacted with through the years have always been warm and inviting and I always wondered if there might be a desire within Swat to interact – at length – with individuals like me. We in the military come from a variety of backgrounds and I truly believe that the Swat community would be fascinated with some of our stories. We too are actually committed to the greater virtues of diversity and advancement for those who would otherwise be left behind. If in fact Swarthmore seeks to expand its dialogue with members of the military community, I hope you will call on me for heartfelt and meaningful insights. As a parent of a student and a veteran myself, I am encouraged that the Swarthmore community is having this dialogue. From my visits to campus, I have only experienced warmth and hospitality–yet it disturbs me to realize there may be an intolerance regarding veterans and the military albeit only anecdotally. I thought one of the values of a liberal education is that of “tolerance” through understanding and not necessarily agreement. I am sure this value manifests itself in many other ways on campus. My family has been fortunate and blessed to have had our son be a member of this community–he loves it! My service as a military member has enabled me to support my son’s love for this community. In the future when many of you become parents, the value of sacrifice will be more intimately instilled within you as you care and raise your children. You will almost do anything for them even though they are not perfect. Equally important, my love of our country allows me to almost do anything for it even though it is not perfect. One of the truly great liberal Presidents inspired me by his words: “Ask not what your country can do for you, ask what you can do for your country.” My prayer for all students is serve others (it does not have to be in the military…see who created the Peace Corps). With that said, I look forward to experiencing the upcoming Parents Weekend and immersing myself deeper into the culture of the campus community! It seems unfair to put veterans on the spot to educate us about “the world.” I don’t think that’s their first priority for coming here, nor should it be the first reason we have to accept them. I agree, that’s why I gave two reasons and said the second (our responsibility to help them) is the most important. I don’t think anyone would demand that veterans educate us about the world, but I think this is something that would naturally occur once they get here. One of the best things about Swat is that it’s a place that helps people open up and share their backgrounds.